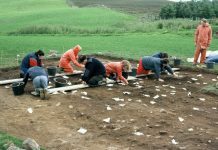 This Project was initiated to examine the perception that, on the limited available evidence, the Neolithic inhabitants tended to favour the area that lay to the north of Biggar whereas the Bronze Age people preferred the lands to the south of the town. To test this perception, a major programme of arable field walking was begun in 1995 in the hope of increasing the number of relevant sites. 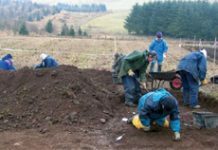 Several Neolithic and Mesolithic sites were found in the area to the north and north-east of Biggar and confirmed by excavation. From the sparse available evidence it appeared that the Neolithic inhabitants of the area favoured the area North of Biggar whereas the Bronze Age people preferred the area to the south of the town. 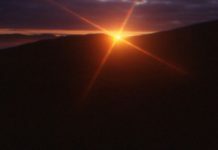 Other relevant sites are Biggar Common, that has yielded evidence of Neolithic and Bronze Age activity, and the group of Bronze Age cairns at Corse Law. 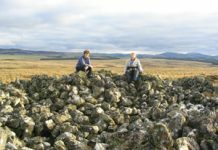 To date, the only known Neolithic sites in the area south of Biggar are on the sides of Megget Reservoir, whereas there is abundant and widespread evidence left by the Bronze Age people. Fields in the Dolphinton area were chosen to initiate the project because from one farm alone, Kippit, ten Neolithic axes had been recovered in the past. These are now in the National Museum of Scotland. Almost without exception the fields explored produced some finds – in some cases only a few random objects, in others a ‘background’ scatter of lithic material. Less commonly. 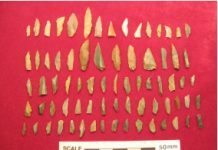 discrete concentrations of lithic materials and, in a few cases, pottery sherds were discovered. Excavations were carried out at a number of these concentrations. In most cases, the sites proved to be of Mesolithic and/or Neolithic date. However, at Howburn Farm, the excavation recovered, in addition, artifacts in flint, and other exotic materials, that proved we had found Scotland’s only known Late Upper Palaeolithic site. Further excavation of this important site is currently taking place. Interestingly, although a Roman road is supposed to run through the area, no Roman objects have ever been found.